Nagpur: In a sensational incident, a mother-son duo, who was reportedly missing, was murdered and their bodies dumped in a pit in a farm in a village in Bhandara district. The accused has been arrested. The deceased Lata Anirudh Bawne (35) and her son Dheeraj Anirudh Bawne (18), both residents of Hudkeshwar Nagpur, had gone missing and a complaint (No. 102/2018) was registered with Bhandara Police Station. A team of Nagpur Rural Police was investigating and searching the missing mother-son duo. 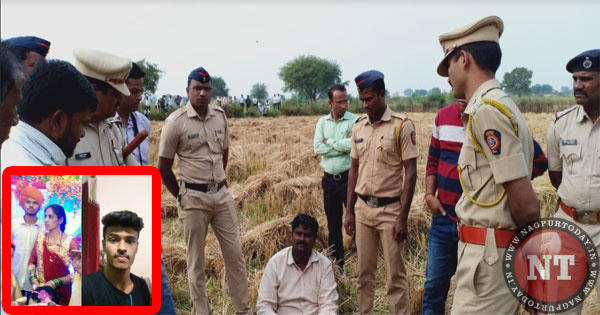 During investigation, it got revealed that the accused Anirudh Bawne murdered his wife and son and dumped their bodies in a pit at a farm in Aroli village of Bhandara district. According to sources, for remitting son’s school fees and meeting other expenses, both the mother-son duo had gone to village Khat on November 26 and demanded money from the accused Anirudh Bawne. But instead of giving them money, the accused stoned his wife and son to death and dumped their bodies in a farm. However, when brother of Lata, Narayan Dahake enquired about his sister, the accused told him he dropped her at Bhandara. But since both Lata and her son Dheeraj were missing, a complaint was registered with Bhandara police on December 2. The accused Anirudh himself turned up at Aroli Police Station on Tuesday and confessed murdering his wife and son and dumping their bodies in a farm.